Voting at the polls is a cornerstone of democracy today. When we think about, and understand, democratic participation, we imagine casting some kind of vote for some kind of person or issue in some kind of election. Unfortunately, a focus on voting narrows the possibilities for democratic participation, which is really all about shared decision-making. Don't get me wrong, voting is important. It took us about 2500 years to set up voting as an actual mechanism to make decisions, and even now it's certainly not a widespread practice. The right to vote is a contested aspiration in many corners of the world, and we should support the right of each and every person to an equal voice in community decision making. practices, approaches, and institutions for democratic decision making. What does that mean? Think of people working together on a board or committee to run a farmer's market. Think of citizen assemblies. Think of community forums or participatory budgeting. Think of a group of neighbours organizing a block party. Community governance. Community decision-making. Empowered political citizens from all walks of life. Collaborative governance. Currently, our democratic institutions are centred around: 1) voting, 2) elected representatives. But democracy can happen in so many different ways. 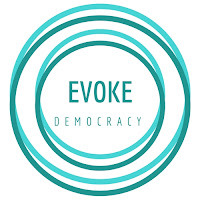 The Evoke research effort is focused on exploring and sharing different and alternative democratic practices that can deepen our civic engagement, and improve community decision-making.